I'm in the process of building a UWP game that utilizes MonoGame and MonoGame.Extended. This game relies heavily on the tile engine. This may be a part of the issue. I was able to workaround all of this mess by copying the tools directory into a lib sub-folder of my project and referencing that path instead. I know the old path used to work - so all I can guess is that somehow the Content Pipeline broke in that is doesn't like the type of reference path that I have to give it anymore. Now that everything builds and runs, I can see the tile map in my game. The tiled map has animated tiles in it, that show up just fine in Tiled. However, in my UWP project, Monogame.Extended.Tiled seems to render them all wrong in the latest version (1.1.0). I had to revert back to 1.0.617 for them to render properly. In 1.1.0 the tiles used in the animation are incorrect and not the correct size (I figure this might just be a position/size loop bug recently introduced). Despite all of these details I love Monogame and these libraries, and look forward to continuing to use them in the future! Please let me know if I can add any further details. Hey man thanks for reporting these issues. 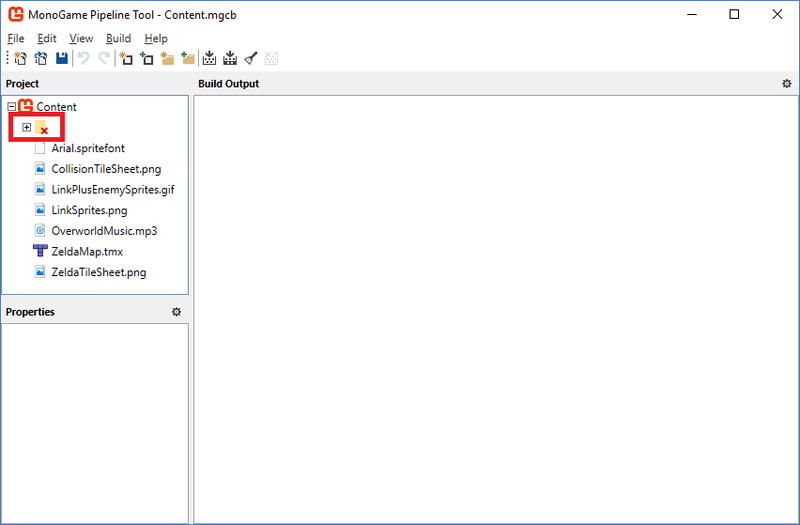 When I initially loaded up my project, I got this weird, broken folder. 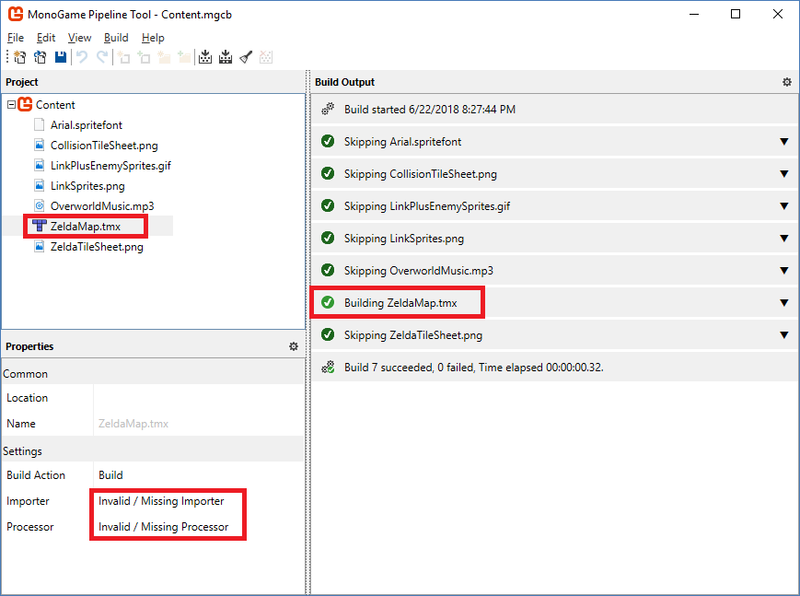 We've seen issues around referencing the Content Pipeline DLL before. Although nothing to the extent that you're getting. It all seems very strange. Probably best to raise that one as an issue on MonoGame's issue page if it's not already there. 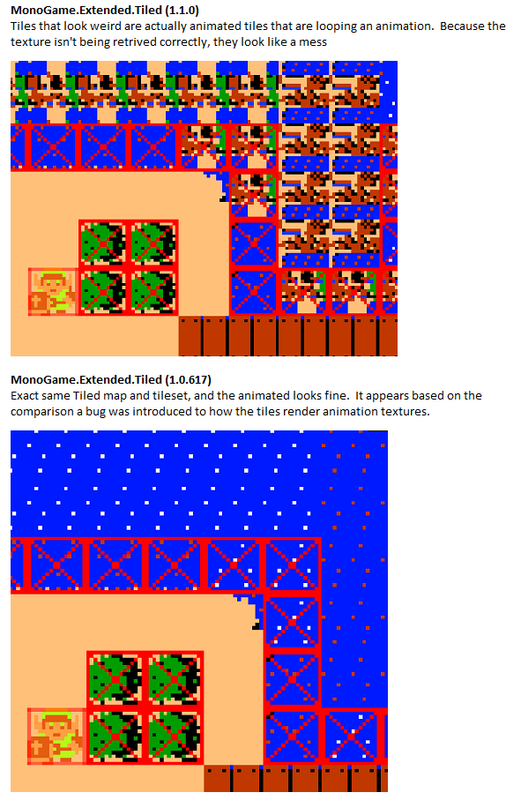 Monogame.Extended.Tiled seems to render them all wrong in the latest version (1.1.0). I had to revert back to 1.0.617 for them to render properly. In 1.1.0 the tiles used in the animation are incorrect and not the correct size (I figure this might just be a position/size loop bug recently introduced). The Tiled rendering issue on the other hand definitely looks like it could be a bug recently introduced. I haven't seen it happen myself though, so I'd really appreciate it if you could raise an issue on our github page with some details about how we might reproduce it. If you're able to provide a TMX file that has the issue that'd be super helpful. I'm not sure what you mean by "incorrect and not the correct size". A screenshot might be useful to explain the problem. Sure thing. I'll get on documenting the specifics and supplying examples as you've asked. Sorry for such a long delay, but I got back to this and discovered the issue. I've put together a pull request (565) for review on the master branch. I'm new to this (open source pull request contributions that is!) but hopefully it is helpful.